ESP8266Basic has built in function for servo control. 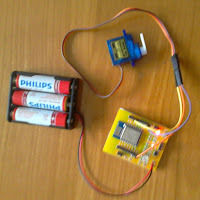 Pin ServoA is ESP8266 pin where signal servo is connected. - Sorry for color of the Dupont cables on photo between ESP8266 module and the servo, exact with servo matching colors are in other projects. 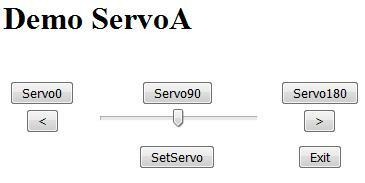 - At some values of ServoA the servo is not sot stable and shaking a little bit. - Values below 0 and higher than 180 ( with > or < buttons ) are not prevented.